Super Cars! I once had a turbo car and thought it was the best thing since sliced bread, totally ‘Super’ in my book. I could hang with the big dogs on the street and get dirty looks from those who quite didn’t understand the outrageous sounds my car made even if it was standing still. In the world of new supercars, everything is simply “fast”. There is no way around it, they are all outrageously fast and Chris Harris has the dream job to test many of them out with the new Porsche 911 Turbo S and McLaren 12C Spider being his latest challenge. 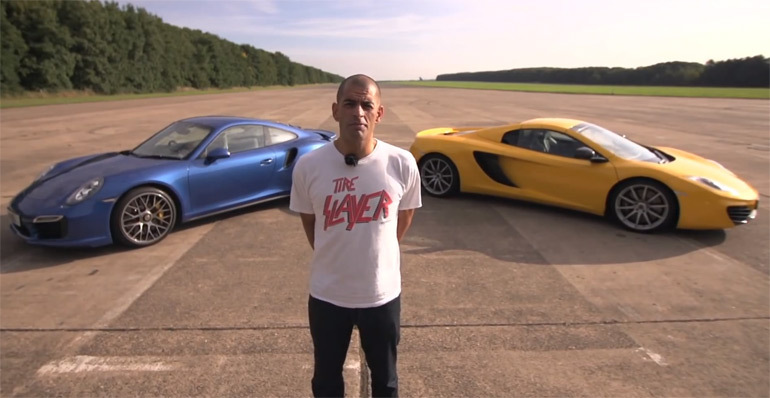 Chris Harris in undoubtedly cheeky in is descriptive language about each and every car he drives and the latest comparison of the 911 Turbo S and 12C Spider is no different. Check out which one he ‘descriptively’ gives a bow at in this recent Drive video below. Enjoy!